Simple crafts provide us precious moments of tranquility and excitement – there’s nothing else to do but MAKE and ENJOY. 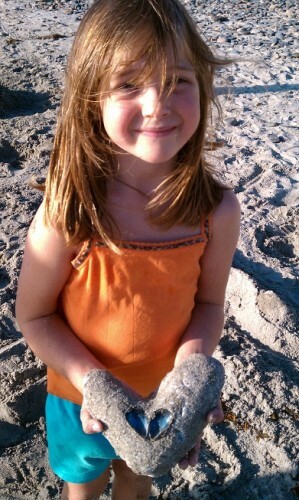 Our best experiences with sand castings happen when we don’t get too fussy. All you need is wet, compact ground or a spot on a sandy beach moist enough to make a mold that will hold. Feeling fancy? You can bring objects with you such as beads, ribbon, glass pebbles and old cookie cutters or bottle caps to use as carving and stamping tools. Or you can simply lug out the plaster, a mixing container and a spatula. That’s it. Look for extras on location. You can find a list of detailed tips below the graphic. Keep Fun Fresh! 1. Use approximately 7 cups of plaster and 3 cups of water for each sand casting. 2. Add plaster to the water NOT water to the plaster. Be careful not to start out with too much water. You’ll end up using all your plaster and it will dry before you can pour it out. 3. Make the plaster mixture like pancake batter. Mix just enough for one casting at a time. 4. Smooth out the mold with a rounded rock. Poke holes with the ends of a stick or feather to create a pattern or design. 5. Use a plastic container to gather the water and mix the plaster. Once dry (less than 10 minutes), the plaster easily cracks and can be dumped out. 6. An old spatula works great because you might need a tool that can smooth out the poured plaster and plaster easily slips off the spatula once dry. 7. 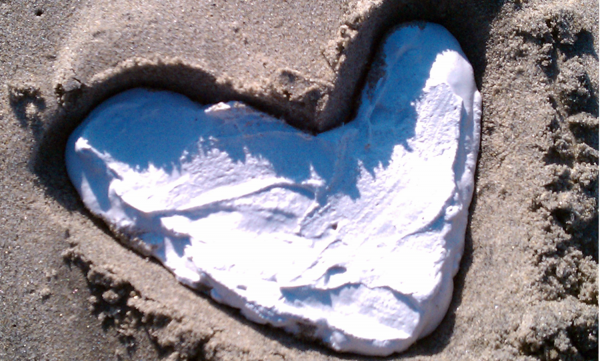 Be extremely careful removing the casting from the sand (after 15-30 minutes). Let it dry for at least 24 hours out of harms way. 8. You can paint the casting a few days later. We like to keep them as-is. 9. Please do not let children play with wet plaster. It can burn their hands. 10. Try not to mix objects in with the plaster. It will make the casting weak. Put the objects inside the impression on top of the sand so that they show on the top of the sculpture when finished. Do you have any experiences with sand castings that would enhance this post or help others? Any questions? Please add a comment – it would be great to hear from you! If you liked this simple craft, check out our version of pinatas! Our kids make repeat request for this one too.